↑ "Dolly Rebecca Parton – The Beginning". Dolly Parton Productions. Retrieved June 14, 2015. ↑ "Biography". The Songwriters Hall of Fame. ↑ Lauren Tingle. "Dolly Parton's Soul-Baring Pure & Simple show". ↑ "Dolly performs on Cas Walker Show – WIVK Radio". Dolly Parton Productions. Retrieved June 14, 2015. ↑ "Dolly's first Grand Ole Opry performance 1959". DollyParton.com. Retrieved July 10, 2015. ↑ "Dolly Rebecca Parton". Smokykin.com. May 2, 2011. Retrieved October 10, 2011. ↑ Parton 1994, p. 142. ↑ Orloff, Brian (March 17, 2008). 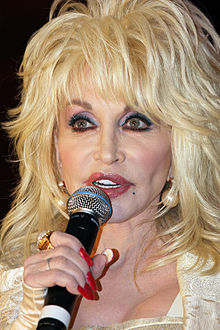 "Dolly Parton Calls Miley Cyrus a 'Little Elvis'". People. Retrieved February 12, 2012.